The Cowan Report: Hurlingham & Chelsea Secondary School Aims For The Sky - So Why Mess With it? Hurlingham & Chelsea Secondary School Aims For The Sky - So Why Mess With it? Phil Cross, the inspirational head teacher at Hurlingham and Chelsea Secondary School, says he wants to lead his school to be “amongst the very best”. He’s not done badly so far. He joined the school five years ago and has turned it into the second most improved secondary school in the country and the most improved in London. Ofsted reported that the school’s “Leadership and management is vision led, and driven by the outstanding leadership of the headteacher and a senior leadership team which is strong”. They also said, “Hurlingham and Chelsea is a good and rapidly improving school with outstanding features”. So why, at the cabinet meeting on Monday night, did H&F Conservatives refuse to include Hurlingham and Chelsea School in the list of borough schools that will have a sixth form? Parents and teachers attended the meeting to hear the Tories explain that they had “pressed the pause button” as they wanted “more information around the school’s vision”. But as the meeting rolled on it became clear that council officials had been telling the school that it would be on the sixth form list as little as two weeks ago. Conservative councillors then pointedly refused to deny that this commitment had been reversed by the Conservative Leadership – which is the explanation that had been leaked by officials. It is fair to ask why the Conservative Leadership again intervened considering that their recent involvement in the school has been little short of catastrophic. Two years ago I sat and watched Cllr. Stephen Greenhalgh (Con), the Leader of H&F Council, being booed by hundreds of parents while he stood on the stage at Hurlingham and Chelsea School. He was there to explain his plans to shut it down - having had the land valued at £24mllion. The Council then put out misleading propaganda saying the school was “failing”. It wasn’t and the Conservatives were forced to eat humble pie when it became clear that the independent adjudicator would not back their request. The Conservative Administration’s own commission then told them that they have lost the confidence of all of the borough’s secondary headteachers. Undaunted by this, the Conservatives then came back with plans to merge Hurlingham and Chelsea with a private school backed by the French Government. That plan was only dropped several weeks back after further set-backs. Teachers, the NUT, the Parents Alliance for Secondary Schools (PASS) and the press had all sat through the cabinet meeting and heard their explanations. The consensus was that "questions hadn't been answered". Later, parents (many of them Conservative voters at the last local elections) told me that they were “unconvinced” by the Cabinet’s explanations and "suspicious of their motives". Polly Woodford, the founder of PASS, did get the Administration to agree to minute that “all [the borough's] secondary schools will get a sixth form”. 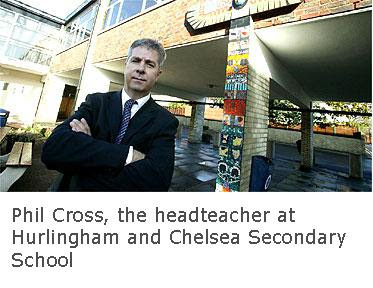 After the meeting was over Phil Cross told me that he just wants to be able to get on with his job and "make Hurlingham and Chelsea into an outstanding school”. I hope H&F Council’s Conservative Administration stop putting hurdles in his way and let him do precisely that. Everything the school has achieved so far has been despite their actions. Hurlingham and chesea is a great school i went there myself . A school where they allow their students to wear short ties, un-tucked shirts, speak inappropriately to one another and use foul language constantly. Who are they kidding, I was praying for that school to be shut-down. My teenage life was ruined because of that school. Just because someone had trouble understanding mathematics, they are forced to join a school that could care less about their students but more on their reputation. I went there for 5 years and I saw plenty to know that Hurlingham and Chelsea is one of the worst schools in London. You would have thought that being London, it would have a number of prestigious schools, only to realise the majority of parents are sending their kids to private schools out in the country because they do a much better job at management and leadership. I left that school worse off than when I came in. I became unhealthy, had no friends, was bullied all the way through till my last days there, never learnt true knowledge but text-book information *which is all rubbish might I add* and I never got a sense that the school was supporting me truly. The school should be burnt to the ground! £2 Billion Sewer Project For Furnival Gardens? Is H&F Council’s Propaganda Being Honest With Us?